by Dr. Graeme S. Lorimer. First published 2006 by the City of Boroondara, Camberwell, Victoria. Floodplain parkland with a billabong, previously a grazing property. Melway ref. 31 K11. • There are fourteen large old River Red Gums, in good health on average. This site’s boundary is shown in red on the aerial photograph and follows property boundaries, except that the boundary with Kew Golf Club (to the southeast) follows the golf course fence (which apparently does not coincide with a cadastral boundary). Amber lines represent other property boundaries. The site comprises all of two properties and part of a third. The most easterly property (1585 Burke Rd) is unreserved Crown land. The next property to the west, with most of the site’s river frontage, is owned by VicRoads. The land between there and the fence of Kew Golf Club is part of 120B Belford Rd (the golf course property). Despite the various ownerships, the land all functions as parkland. It includes the Main Yarra Trail bike path. Land use changes are strongly limited by land zoning and planning overlays. Elevation: The normal water level of the Yarra River is at an elevation of 6 m. The floodplain that comprises the rest of the site has an elevation of 10-11 m, except for an artificial embankment beside the garden centre marked on the aerial photograph, which reaches 18 m.
Land form: Floodplain, river and billabong. Slope: The floodplain slopes very steeply to the waters of the Yarra River, and the embankment beside the garden centre has a gradient of 1:6. Elsewhere, the site is generally flat. Soil type: Alluvial deposits washed down by the river, and possibly some older deposits from the ancient lake that once covered the area from Chandler Highway to Templestowe. Underlying geology: Far below the surface, there is Silurian sedimentary rock of the Andersons Creek formation, but this does not influence the natural features of the site. This site is clearly one of the most biologically significant sites in Boroondara, and there are likely to be significant features yet to be discovered. The billabong may well be the most significant part of the site, but it could not be properly investigated for this report because it remained full of water for the whole period during which an inspection was possible (February to April 2005). The aerial photograph shows that the billabong floor was fully vegetated in the previous August, but the only evidence of this when the author visited was an abundance of Water-ribbons (Triglochin procera). It would be highly desirable to survey the billabong’s vegetation once the billabong dries out, because all other billabongs on the Yarra floodplain in Boroondara support rare plants. The prolonged inundation around the billabong killed most of the indigenous Prickly Currant-bush (Coprosma quadrifida) on the northwestern bank of the billabong, as well as large expanses of the serious weed, Wandering Jew (Tradescantia fluminensis). River Red Gums (Eucalyptus camaldulensis) and Silver Wattles (Acacia dealbata) appeared unaffected, as were the weeds, Hawthorn (Crataegus monogyna) and Willow (Salix species). The remains of a stock enclosure and the pattern of past clearing and regrowth indicate that this site was once a grazing property, possibly with a building near the northwestern end of the billabong. Not all the native vegetation was cleared for grazing, and at least fourteen centuries-old River Red Gums (Eucalyptus camaldulensis) remain. These are marked on the aerial photograph with crosses, scattered around most of the banks of the billabong and some of the riverbank. They are part of the endangered Ecological Vegetation Class called Floodplain Riparian Woodland, and the most ecologically intact representation is between the billabong and the surrounding dashed outline on the aerial photograph. Northward from the billabong to the Yarra River bank, the original forest was once cleared but now has a dense covering of tall regrowth of Silver Wattles (Acacia dealbata). The understorey beneath the wattles is almost entirely composed of serious weeds, dominated by a dense carpet of Wandering Jew (Tradescantia fluminensis). Although this vegetation is greatly simplified compared with the original Floodplain Riparian Woodland, small insect-eating birds heavily populated the treetops during the fieldwork for this project. At the northern tip of this area of wattle regrowth, there is also a highlight of the site: a copse of approximately eleven Muttonwood trees (Rapanea howittiana) with trunk diameters to 25 cm (Photo 1, page 97). There are also other Muttonwoods directly over the opposite side of the river, but no other mature Muttonwoods were found during this study. Apart from the wattle regrowth north of the billabong, the banks of the Yarra River within the site support a gallery of Floodplain Riparian Woodland, including the characteristic shrubby understorey of Tree Violet (Melicytus dentatus), Prickly Currant-bush (Coprosma quadrifida) and Hemp Bush (Gynatrix pulchella). There are approximately one hundred Hemp Bushes in the site, and the only other site in Boroondara with a substantial number of this locally endangered species is the Freeway Golf Course (Site 4). The native ground flora of the Floodplain Riparian Woodland in this site has been mostly replaced by weeds, as in all other occurrences in Boroondara. Site 6, Photo 1. The copse of Muttonwoods (Rapanea howittiana), with the Yarra River immediately behind. This photograph is to illustrate the condition of the trees, including the luxuriance of their crowns. The foreground trunks on each side are Silver Wattles (Acacia dealbata). Site 6, Photo 2. Close-up of a typical patch of Lepidium pseudohyssopifolium (the upright, leafy stems) amid Blackberry, with the weeds White Clover (Trifolium repens) and Cleavers (Galium aparine) also visible. The indigenous species, Geranium sp. 5, was growing in similar conditions very close by. To the south and west of the billabong, in the area marked ‘Pastoral Woodland’ on the aerial photograph, there has been only patchy regrowth of native trees (again, principally wattles), augmented by some planted eucalypts in the southeast. The wattles carry large numbers of the locally vulnerable Grey Mistletoe (Amyema quandang), representing most of the total population of that species in Boroondara. There are very few indigenous shrubs, well outnumbered by Blackberry. The ground flora is also very weedy, but it nevertheless contains at least one dozen of Lepidium pseudohyssopifolium, which is listed by the Department of Sustainability & Environment as ‘poorly known and suspected, but not definitely known, to be [rare or threatened]’. In addition, there are several specimens of this species on the western bank of the billabong, collectively giving the site the largest population of Lepidium pseudohyssopifolium in any site in Boroondara. Most of the Lepidium pseudohyssopifolium plants grow among Blackberry, as illustrated by Photo 2. The ‘pastoral woodland’ area was also observed to house Tiger Snakes and Common Blue-tongued Lizards. There are likely to be other reptiles. 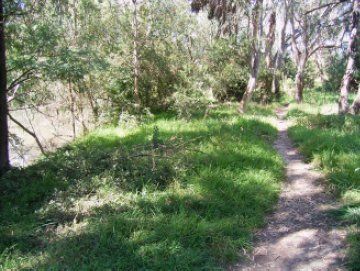 This site includes part of the almost unbroken corridor of vegetation that extends along the Yarra River upstream from Yarra Bend Park. The river and its vegetated fringe are arguably Melbourne’s foremost ecological corridor. The treed area in this site extends further from the Yarra River than any other section of riparian vegetation in Boroondara other than Yarra Bend Park. The site can therefore be viewed as an ecological node on the Yarra River corridor. Water Body (No EVC number). 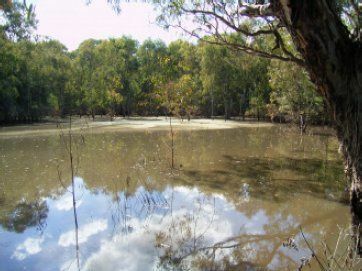 When it holds water, the billabong provides open water habitat for fish, ducks and other aquatic life, although little wildlife was evident during the author’s visits in March 2005. Floodplain Riparian Woodland (EVC 56, endangered in the Gippsland Plain bioregion) Found mainly beside the Yarra River and around the billabong. 25 indigenous plant species and 58 introduced plant species were found. 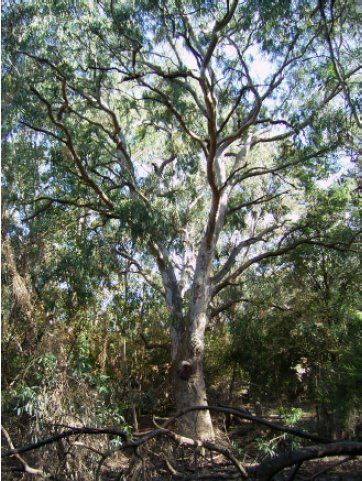 Canopy trees: Eucalyptus camaldulensis, to 1·45 metres trunk diameter, with crowns overlapping. Shrubs: Melicytus dentatus (=Hymenanthera dentata) is rather dense and typically 2-3 m tall. The population of approximately 100 Gynatrix pulchella beside the Yarra River is the largest known in Boroondara. Coprosma quadrifida is moderately common. Eight Goodenia ovata plants and one Bursaria spinosa were seen. Ozothamnus ferrugineus is absent, presumably as a result of past clearing. The shrub weed, Crataegus monogyna, is abundant. Vines: No indigenous vines were found. The weed, Calystegia silvatica, is scattered. Ground flora: Mature plants of Microlaena stipoides, Juncus amabilis and Lepidium pseudohyssopifolium are fairly common. In addition, at the time of the fieldwork, Persicaria lapathifolia, Persicaria subsessilis, Alternanthera denticulata and Urtica incisa had regenerated profusely since the flood eight weeks earlier. The young plants were growing through a layer of silt and flattened, dead weeds, particularly Tradescantia fluminensis. Otherwise, the ground flora comprised predominantly introduced species. Floodplain Wetland Complex (EVC 172, regionally Endangered) Occurring in the billabong, as outlined on the aerial photograph. 4 plant species were found, all of them indigenous. The vegetation within the billabong cannot be adequately described here because the billabong remained full of water for the whole period during which an inspection for this study was possible (February to April 2005). Canopy trees: Eucalyptus camaldulensis of various ages are fairly dense in the shallow, eastern end of the billabong, with crowns touching each other. Other woody plants; Vines; Ferns: None. Ground flora: At the time of the fieldwork, there were many Triglochin procera emerging from the water. The only other plant species visible were Carex appressa and Juncus amabilis at the water’s edge. Habitat scoring (see p. 13) was conducted within the area of Floodplain Riparian Woodland that surrounds the Billabong and lies within the dashed outline on the aerial photograph on page 95. The ecological condition within this area is fairly uniform except for weed cover, which varies from more than 50% in the west to less than 5% in the northeast. The calculated habitat score varied between 40% for the weediest section to 51% for the least weedy section. As a quirk of the habitat scoring method, the scores would have risen by ten percentage points if a single scrambler or climber were found. This is quite likely to happen once the vegetation regenerates following the flood of February 2005. The species listed in the table below were all observed in March 2005. The conservation status ratings (e.g. vulnerable or endangered) are explained in Section 2.5.2 (page 18). The following table includes all twenty-eight indigenous plant species and fifty-eight introduced plant species found at the site during this study, plus two species collected by Helen I. Aston in 1964, categorised according to the species’ presence in four areas of the site. The column labelled "Area A" is for the Floodplain Riparian Woodland around the billabong and beside the Yarra River. "Area B" is the wattle regrowth north of the billabong. "Area C" is the "Pastoral Woodland" area marked on the aerial photograph (page 95). In the grid squares, ";D" indicates a species that is dominant in its vegetation stratum; ‘M’ means that many plants were found; 'm' indicates moderate numbers; and "-" means that very few plants were found. Species with underlined names would be suitable for collection of seed or cuttings. The site is notable for the presence of fourteen identified River Red Gums (Eucalyptus camaldulensis) that qualify as large old trees according to the Department of Sustainability & Environment’s criterion for Floodplain Riparian Woodland (i.e. trunk diameters of at least 0·8 m). These are marked with cyan crosses on the aerial photograph on page 95. The maximum diameter was 1·45 metres, which makes it one of the largest indigenous trees in Boroondara, hundreds of years old. The health of all but two of the trees was rated by the author as good. The exceptions were one in very good health and one in fair to good health. The significant fauna species in the list below have been observed in the Burke Road Billabong site. The conservation status ratings (e.g. endangered or vulnerable) are explained in Section 2.5.2 (page 18). The following list includes all fauna species recorded at the site. The names of species not detected in the present study are accompanied by the date of the most recent record. Asterisks indicate introduced species and obelisks (†) indicate that breeding was confirmed. This site is part of the Department of Sustainability & Environment’s BioSite number 5063, which extends along the Yarra River from Burke Rd to Chandler Hwy, on both sides of the river. The significance level given in the BioSites database is ‘Regional’, but this was based on information and criteria from the 1990s that are now obsolete. The following is an assessment against the current BioSites criteria of the Department of Sustainability & Environment (Amos 2004). BioSites criterion 1.1.1 attributes Local significance to ‘All parts of riparian systems with riparian vegetation present’, which applies to this site. BioSites criterion 1.1.2 attributes Local significance to ‘Areas of 100 ha or more of contiguous native vegetation in a heavily fragmented landscape’, which applies to the corridor of vegetation along the banks of the Yarra River (extending upstream and downstream of this site). BioSites criterion 1.2.6 attributes Regional significance to links of regional-scale ecological corridors, which applies to this site because its vegetation represents a component of the Yarra River corridor. According to the criteria of ‘Victoria’s Native Vegetation Management – A Framework for Action’ (NRE 2002a), even quite degraded native vegetation belonging to an endangered EVC (including both EVCs on this site) has a conservation significance rating of High. The conservation significance rises to Very High where the habitat score is at least 40% within an area of an endangered EVC, and the habitat score for part of the Burke Road Billabong site was found to be 51%. According to BioSites criterion 3.2.3, State significance applies to any site with a ‘remnant patch’ whose conservation significance is High or Very High due to the presence of a threatened EVC. This applies to the present site, noting that the area and native understorey cover of the native vegetation easily meets any reasonable definition of a remnant patch. The site has a modest population (approximately one dozen plants) of Lepidium pseudohyssopifolium, which is listed by DSE (2005a) as suspected (but not confirmed) to be rare or threatened. BioSites criterion 3.1.2 attributes Regional significance to such a site, taking into account that the species is not endemic to Victoria. The site also supports ten other species of plants that are threatened in Boroondara, some of them in abundance. Each one of the species with viable populations gives the site Local significance according to BioSites criterion 3.1.5. It is not clear how many of the significant fauna species recorded in this site have viable populations that rely to a substantial degree on the site’s habitat, other than the Victorian Smooth Froglet (which has been recorded repeatedly from the billabong). However, it only takes one such species for the site to qualify for Local significance according to BioSites criterion 3.1.5. All riparian vegetation has a Very High hazard rating for waterway protection according to Appendix 1 of Victoria’s Native Vegetation Framework (NRE 2002a). This is separate from conservation significance, and indicates the level of importance that should be placed on protecting, restoring and revegetating riparian vegetation such as in the present site. The following threats to the site’s ecological values are presented in a form to suit the Department of Sustainability & Environment’s ‘BioSites’ database. * Serious: Box Elder (Acer negundo), White Bladder-flower (Araujia sericifera), Hawthorn (Crataegus monogyna), Couch (Cynodon dactylon), Black Bindweed (Fallopia convolvulus), Cleavers(Galium aparine), Crack Willow (Salix?fragilis), Pampas Lily-of-the- Valley (Salpichroa origanifolia), Wandering Jew (Tradescantia fluminensis). Soil erosion of the banks of the Yarra River during flood. Eucalypt dieback disease due to psyllids and/or leaf skeletonisers. This threat appears to have been a problem previously and is likely to recur from time to time. The population of the aggressive Bell Miner is out of ecological balance and is evicting birds such as small insectivores. This, in turn, represents a threat to the health of the River Red Gums. Pollution of water or sediment in the billabong (suggested by the presence of an algal bloom and the apparent paucity of normal aquatic life). Carp or other native fish, causing turbidity, eating native fauna (e.g. tadpoles) and competing for resources with native fauna. The site appears to have been historically managed as a grazing property. Old drums and other metal waste have beendumped by the billabong. The drums may have had farm chemicals in them, and leakage into the billabong may explain the apparent paucity of aquatic life. In recent years, there has been a small amount of revegetation in the southeast of the site, comprising only tree species. Expanses of pasture grass and weeds in the ‘pastoral woodland’ area had grown rank at the time of the inspection for this study (March 2005). Other serious but tractable weeds, such as Blackberry and Hawthorn (Crataegus monogyna), were also rampant. The exception was Gorse (Ulex europaeus), which had been sprayed recently with a reasonable degree of success. Overall, the site is not receiving the level of management effort required. 1. Very important and urgent: Devise and implement a staged program to control blackberry and Hawthorn, and follow up the recent control of Gorse. (These species are all declared noxious weeds.) Use chemical(s) that do not pose a serious threat to the herbaceous rare plant, Lepidium pseudohyssopifolium, which grows among some of the blackberries. Near the billabong, use a chemical or method that presents low risk to the aquatic environment. Aim to remove these weeds over several years, synchronised with a program to plant indigenous shrubs (particularly Coprosma quadrifida, Melicytus dentatus, Melaleuca ericifolia and Callistemon sieberi) to provide substitute habitat for small birds such as wrens. These actions probably require cooperation between the organisations responsible for the Crown land and VicRoads property. 2. Destruction of the weeds, Sweet Pittosporum (Pittosporum undulatum) and Box Elder (Acer negundo), is not quite as urgent as the noxious weeds just discussed. However, depending on the method employed for removing the Hawthorn, it may be economical to do so in conjunction with the Sweet Pittosporums and Box Elders. The importance and urgency are both moderate. 3. Spray the needle-grass (Nassella/Stipa ?neesiana) on and beside the slashed vehicle route to the Melbourne Water sewer inspection point in the northwest of the site. This weed species appears to have been spread by the slashing or use of this route. Spraying should be done in November, when it can be readily identified, with follow-up in subsequent Novembers. The importance is moderate and the urgency is high. 4. Arrange testing for chemical contamination of water and sediment in the billabong. This is because of the unexpectedly low aquatic life (other than algal bloom) that was seen during the inspection of the site for this report. This should be done urgently and is of high importance. Carp should be considered as an alternative explanation. 5. Collect a small proportion of the seed of each plant of Lepidium pseudohyssopifolium and Rapanea howittiana, to allow propagation for planting within the site or in secure locations elsewhere along the Yarra River (e.g. Yarra Bend Park or Freeway Golf Course). 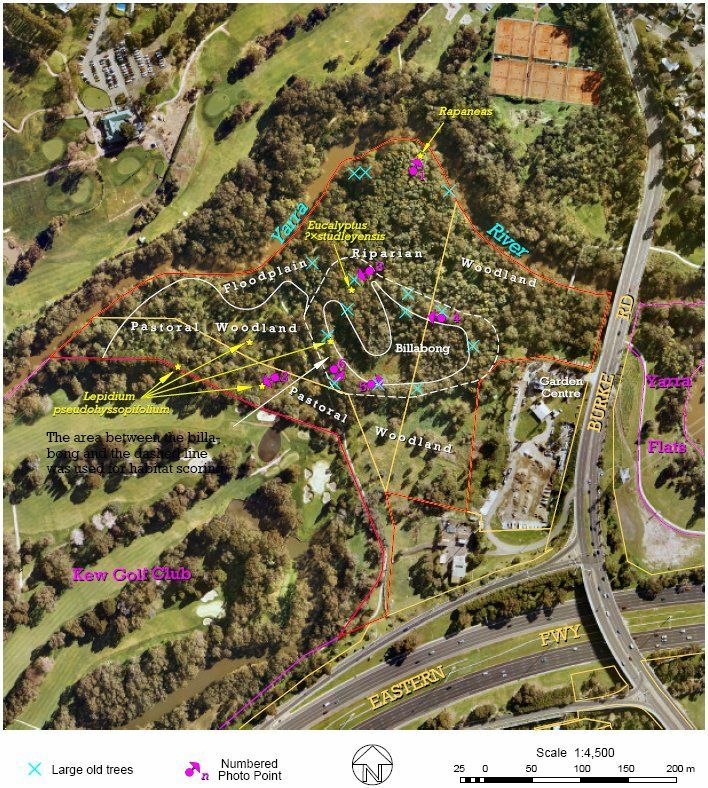 Development of a program of future revegetation would require knowledge of plans for the future of the Crown land, the VicRoads property and the part of the golf club land that lies within the site. A landscape plan would be highly desirable. Some recommendations for revegetation are expressed in Priority Actions 1 and 5 above. 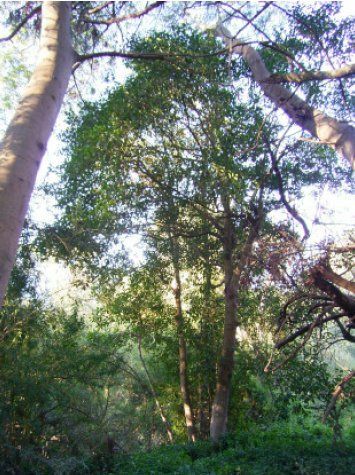 The western bank of the billabong, where the Main Yarra Trail passes close to the billabong, could be a high priority for bushland rehabilitation and creation of a safe, attractive access to the billabong. Species of plants that are growing in the site and would be suitable for collection of seed or cuttings are underlined in the full flora list above. 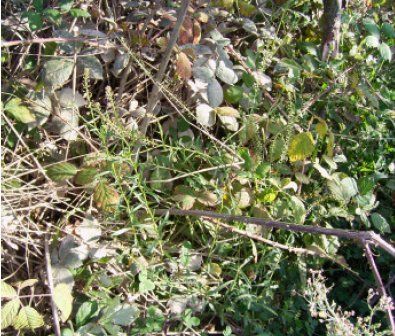 If it becomes possible to obtain plants of Calystegia sepium that are known not to be genetically contaminated by the serious weed, Calystegia silvatica, they would be ideal for planting by the river and billabong. A single plant of this species (or another indigenous scrambler or climber, such as Calystegia marginata) next to the billabong would be enough to raise the habitat score by ten percentage points. Records should be kept of any planting done in this (or any other) site, including species, numbers and locations. Prior to this study, the only pre-existing data suitable for ecological monitoring were the meticulous records of frogs by Ewen McGilp in 1994. The present study could not inspect the billabong during a suitable season to provide complementary frog data to allow a comparison with McGilp’s data, other than to confirm that the Victorian Smooth Froglet remains. • Photographs 1, 3, 4, 5 and 6 as displayed on pages 97 & 104, with locations and orientations shown on the aerial photograph on page 95. All were taken on 30th March 2005. Original digital images are available separately. Repeat the photographs about every two years. Check tree foliage density, the abundance of weeds and structural changes in the vegetation. • The flora lists for the various parts of the site, as provided beneath the heading ‘Full flora list’ above. • Ratings of weed severity within each part of the site, stored in the database of this study. • Population sizes of scarce plant species, as indicated beneath the heading ‘Flora of special significance’ above. • Tree health ratings, as stored in the geographic information system data from this study and summarised above. • The habitat score determination for the zone around the billabong, as marked with a dashed line on the aerial photograph. The original field data sheets are available separately. Repeat every two to four years. Check the abundance of weeds, structural changes in vegetation, changes in habitat score and the species present. The locations and orientations of the photographs are shown by numbered arrows on the aerial photograph on page 95. Site 6, Photo 3. A large River Red Gum in good health at the north of the billabong. The purpose of the photograph is to show the tree's overall condition and the luxuriance of its crown. The leaves of Box Elders are turning yellow for autumn. Site 6, Photo 4. A westward view of the northeastern shore of the billabong, taken from 2 m south of an extremely large River Red Gum. The ground is bare due to a record flood seven weeks prior. Coprosma quadrifida plants have died from waterlogging. Site 6, Photo 5. Looking east over the southern part of the billabong, from a pile of metal rubbish in the billabong's southwestern corner. The large tree on the righthand edge is marked on the aerial photograph on p. 95. The River Red Gums in the eastern end of the billabong had been flooded for at least seven weeks (and probably rather longer) when this photograph was taken. Site 6, Photo 6. Looking southeast between the billabong and the Main Yarra Trail, taken at the intersection of two informal, well-worn footpaths. The purpose of the photograph is to show the present weedy state of an area that should be rehabilitated by weed control, revegetation and possibly an improved path to the billabong. • Maps of geology and topography produced by agencies of the Victorian government. 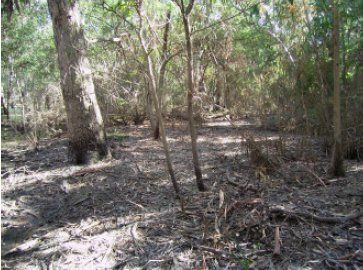 • It would be desirable to investigate the vegetation of the Burke Road Billabong when it dries out. All nearby billabongs were found to support rare flora, and the same is likely in the Burke Road Billabong. Particular attention should be paid to the possibility that Amphibromus fluitans occurs in the billabong, which would represent National significance as the type locality for that species. • A survey of frogs in the billabong would be desirable in spring. It would also be desirable to check for the nationally threatened Warty Bell Frog (or Growling Grass Frog) in hot summer weather. • As noted above, tests should be conducted for pollution of water or sediment in the billabong, prompted by the unexpected paucity of aquatic life observed in the inspection of the site for this study. Carp should be considered as an alternative explanation. • This site would be one of the most promising in Boroondara for any survey of reptiles or bats.